How to Chop Onions Like a Pro. Best to decide what is age appropriate for your kids to do chopping (recommended ages 6-7 for paring knife on soft foods; ages 8-9 for root vegetables and best if supervised). Grownups should help cut the onion in half. Lay one half flat on a cutting board and cut off both ends. Peel off the skin. Slice the onion crosswise. Make as many cut lines as you can fit on the onion. Hold the knife firmly and tuck fingers back. Flip the onion slices sideways and lay flat on the cutting board. Cut downward to dice. Then finish off with a quick chop. One important place you might use chopped onions is in making soup – yum! What’s your favorite use of onions? Do you like them on hamburgers? How many recipes can you think of that include onions? Learning to chop vegetables is also important for making Pico De Gallo Salsa for dips – which uses another type of onion, called scallions. Scallions are used in lots of dishes when you are looking for a milder taste than onions. Our favorite is this quinoa salad recipe. 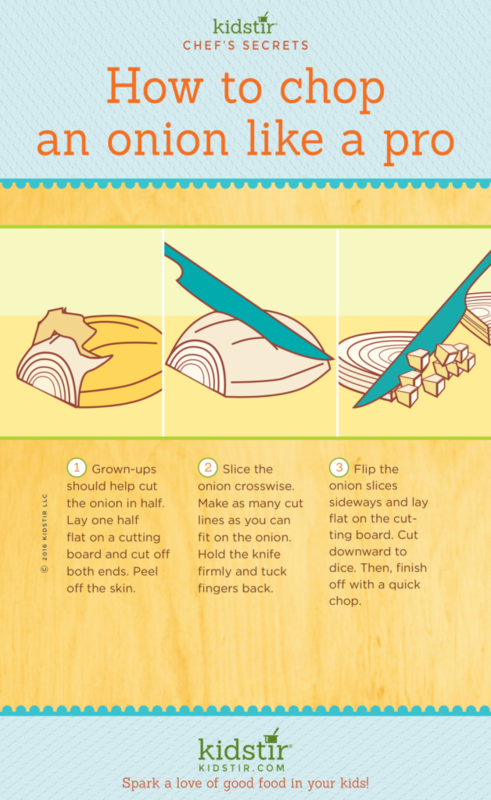 We’d love to offer our Kids Chopping Onions Like a Pro Infographic for you to share on your blog. Just select and copy the code snippet below and paste into your next blog post. 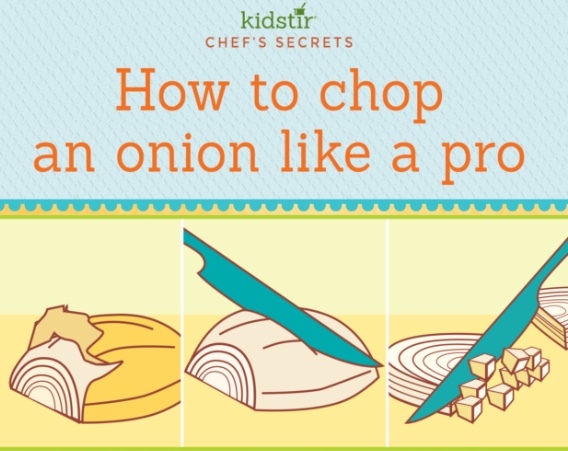 We’d love for everyone to share this page on social media or email using the buttons below so all the kids you know can learn how to Chop Onions like a pro! Next post: What are Root Vegetables?